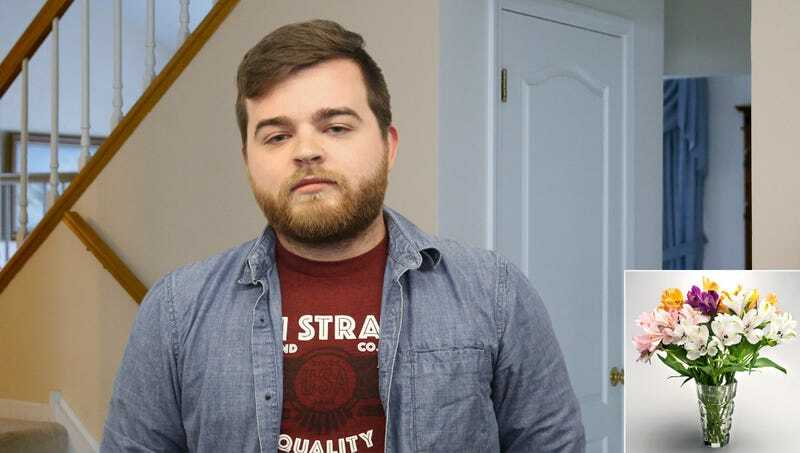 CHICAGO—After he picked up the first $14.99 floral arrangement he saw at his neighborhood drugstore Friday, sources confirmed local man Connor Wurster was apparently banking on unconditional love doing most of the heavy lifting for the bouquet he selected as a Mother’s Day present. “This one looks decent enough, and it has a pretty good number of flowers,” said the 29-year-old, who will reportedly rely upon the deep affection of the woman who gave birth to him to pick up the slack for the assortment of peach roses, stargazer lilies, and baby’s breath he purchased with five minutes to spare before leaving to visit his parents for the weekend. “Plus, it comes with a vase. I don’t know, maybe I should get some chocolates, too [in order to avoid having to depend so completely upon a mother’s limitless and profound love for her child being truly eternal].” At press time, reports indicated Wurster had added a note saying “I love you so much” just to be safe.